Gary asks: Who invented the common shopping cart that seems to be the exact same design in most stores you go to? 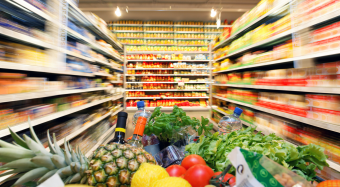 With the emergence of the automobile, home refrigeration, and the supermarket in the early 20th century, retailers soon realized they had a problem – people now were willing to purchase large quantities of food at once, but had no effective means of comfortably carrying everything they wanted around the store. In the early 1930s, the general solution was to have people carry around baskets… Needless to say, something needed to be done. 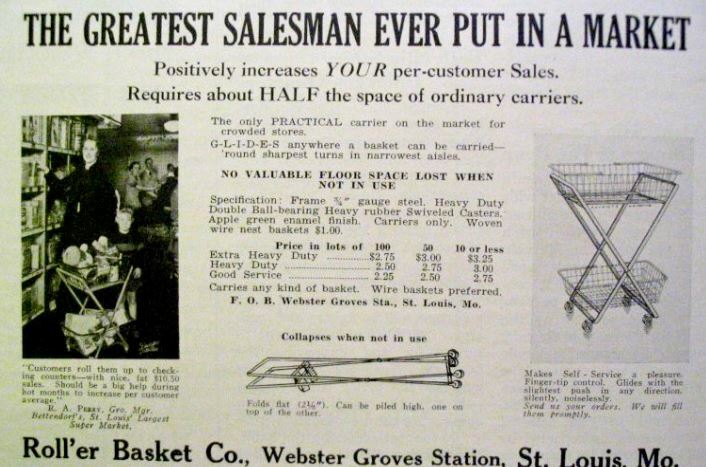 While today the solution to the problem seems obvious, in the 1930s, it wasn’t and it would take about two decades of iterations before the modern shopping cart would finally emerge. While numerous shopping cart-like devices popped up here and there during the early 1930s, it was a particular 1937 folding-chair cart design by American businessman and inventor Sylvan Goldman that really took root and saw the shopping cart quickly becoming commonplace. Goldman was born into a retailing family and opened his first shop with his brother Alfred, Goldman Brothers Wholesale Fruits and Produce, during the oil boom in Breckenridge, Texas. Once the boom ended in that town, so did the business, and the brothers moved on, opening the Sun Grocery Company in Tulsa, Oklahoma in 1920. Wildly popular, within three years the business became a chain with 55 retail locations. The brothers sold the chain to Skaggs-Safeway Stores in 1929, only a few months before the Stock Market Crash (1929) and Great Depression (1929-1939). Unfortunately for them, they lost most of their wealth in the crash and so headed out to California where they worked for various grocery wholesalers. But soon they found themselves back in Oklahoma; this time in Oklahoma City. You see, the brothers got an offer they just couldn’t refuse from some wealthy uncles. 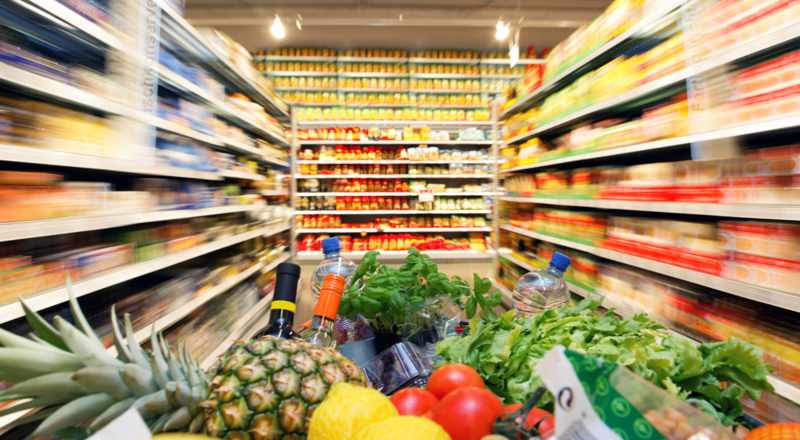 These uncles gave them extremely favorable terms in financing the brothers purchasing the small, five-store Standard Grocery. They quickly turned these businesses around and, in 1934, purchased the struggling Humpty-Dumpty chain of grocery stores. It was here that Sylvan Goldman observed the fact that in their newly modified supermarket-concept grocery stores, mothers with young kids struggled to manage their charges and purchases at the same time, having only small baskets to carry around. To solve this issue, Goldman first began having clerks at his stores wander around collecting full baskets from customers, with the clerks taking them up to the register to hold and giving the customer in question a new empty basket to fill. This wasn’t an effective solution. From here, it’s difficult to separate fact from winner-narrative in the invention of this particular cart. While the later official story from his company would have you believe Goldman simply thought up a wheeled cart independently of what anyone else had tried, advertisements from the era paint a different picture, with numerous shopping-cart like devices tried by various companies, none of which were very successful. For instance, in the late 1920s Henke & Pillot of Houston Texas had a store with a fifteen-inch wide track raised off the floor that customers could use to slide their wheeled baskets along as they shopped. Essentially, this was a train version of a shopping cart. It didn’t catch on. The 1930s saw improved wheeled basket designs, such as one invented by Joe Weingarten which was a shopping cart modeled after a toy wagon. Others improved on this, even coming up with designs that were strikingly similar to what Goldman ultimately came up with. However, even among those designs that were extremely functional from the customer end, the most notable problem with many of these was that they simply took up too much storage space. This is where Goldman came in and partially why he is often thought of as the inventor of the modern shopping cart. Goldman, no doubt aware of the issues other stores who’d tried some form of shopping cart were having with space, decided to model his design after a folding chair, with inspiration supposedly striking when he was contemplating the issue in his office in 1936 and spotted a folding chair there. 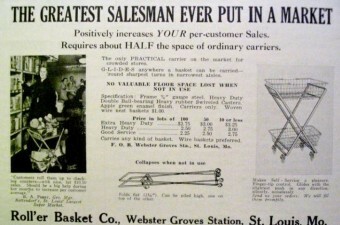 After working out the kinks (making sure it wouldn’t fold up unexpectedly or tip over too easily) with one of his employees who worked as a handyman, Fred Young, Goldman and Young settled on a folding metal frame with wheels that would hold two baskets (one on top, one on the bottom). The baskets could then easily be removed and stacked when it was time to fold up the cart’s frame, in both cases the whole contraption taking up relatively little space and being easy to assemble and disassemble. Goldman also devised a method for mass-producing his carts with the help of another handyman, Arthur Kosted, and he obtained a patent (No. 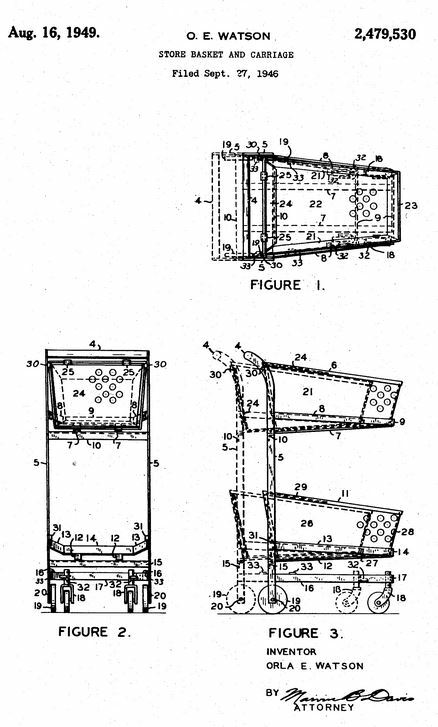 2,196,914) for his cart in 1940. The ad did not, however, show what the new product was, making customers come in to see what all the hullabaloo was about. As such, the only people that used them initially were the elderly. Goldman also found the carts a tough sell for his fellow grocers when he presented them at a trade show. The chief complaint was that they felt that children would run amok with the carts, causing havoc in the stores. Goldman quickly solved all the issues, however. First, he hired several manly looking men and various women to simply walk around in his stores using the carts all day long. At the same time, he hired greeters to give customers carts and show them how they worked. As for convincing his fellow businessmen that their concerns about kids were not an issue, he had his employees pose as real customers walking around with the carts and their kids in the store, all in a very orderly fashion. He then filmed this and later showed it as a demo to his fellow grocers. Both of these things worked and he quickly had a backlog of orders for carts several years ahead of what he could actually produce. He then licensed out the design to other manufacturers to help out in this regard. At the same time, his carts in his own stores were helping boost business significantly as people began to purchase much more each time they shopped than they had before and the carts served to draw customers to him instead of his competitors in the early days when he was the only one that had them. Although the carts were useful, they were still not ideal in that they were really just basket holders that had to be more or less assembled as the customers arrived and taken apart when they left. While very functional over the previous options, it still wasn’t ideal. To address the problem, in 1946 50 year old draftsman and freelance inventor Orla E. Watson devised the first telescoping, nesting shopping cart. While his first design called for only a telescoping frame (where the baskets were removed before pushing them together), his second prototype had permanently attached baskets that also telescoped and nested. It is this design (patent No. 2479530) that forms the basis for the shopping carts we use today. Unfortunately for Watson, he had a whirlwind of legal battles ahead of him because of how good his invention was, with Goldman’s company being the root of most of his problems. You see, when he first came up with the design and prototype, Watson began showing it around hoping to get investors and generate interest. This worked and salesman George O’Donnell, who had connections with many supermarket owners, jumped on board. 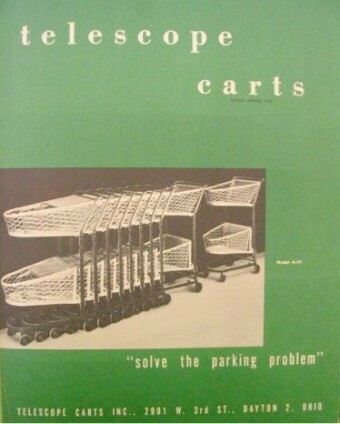 The pair formed Telescope Carts Inc in April of 1947 to sell these new carts. Six months later, they were set to debut their ready to manufacture cart at a trade-fair when Goldman’s firm threw a big bucket of ice over their plans- Goldman announced they too were going to be showing a nesting cart whose design was pretty much exactly Watson’s. Not only that, they were going to offer it for $3 cheaper per cart and had a better infrastructure ready to actually develop the carts en masse. To compound their issues, up to this point, Watson and O’Donnell had been struggling to get the needed steel to make the carts themselves and had numerous manufacturing problems affecting the quality of some of their early efforts. These people have virtually copied our carts and have beat us to the punch with present introduction to this Important Group of Buyers. As stated, they will also be at the Super Mkrt Convention, which of course will present competition, and to a great degree take away from us all the Glamour of being the only ones with such a featured cart. The important question is WHAT HAVE YOU DONE WITH YOUR PATENT ATTORNEY TO HASTEN A THOROUGH INVESTIGATION AS TO POSSIBLE INFRINGEMENT, we cannot afford to take SLOW measures in determining who is right or wrong, something MUST be DONE IMMEDIATELY to ascertain the facts and if at all possible restrain them from exhibiting their cart at the convention. It is unfortunate that there is always someone to spoil one’s fun especially if that fun is good and ours is good and we will be fighting them off continually from now on is my guess. This is just the beginning… I’ll bet it didn’t take all these Cart Manufacturers long to get here and examine our carts at the Floyd Day Store when it was first put in and with all of the talking we’ve done and pictures we’ve passed out it just wouldn’t be possible that they did not know about them and of course they did, and if this Oklahoma outfit knew about them at that time they would have jump down on our neck long before this if they had had any ideas of a patent on this telescope principle. However, a legal battle did ensue over who really invented the nesting cart, despite the fact that documented evidence seems to clearly indicate it was Watson’s invention that Goldman’s firm just copied. But Goldman had a lot of money to throw at lawyers over the issue, which he did in spades. Ultimately Watson’s firm decided to settle out of court, with an agreement being reached on June 3, 1949 wherein Goldman recognized Watson as the inventor of the nesting cart design and paid Watson a whopping $1 for their having infringed on his design for a couple years up to this point. In return for ceasing their legal battle, Goldman was granted near exclusive rights to manufacture the nested cart design (excepting a few licenses that had previously been granted by Watson), and, of course, Watson’s company would be given royalties for every cart sold. So everything was good here, and Watson got to enjoy the fruits of being the inventor of what pretty much all future cart designs would be based on, right? 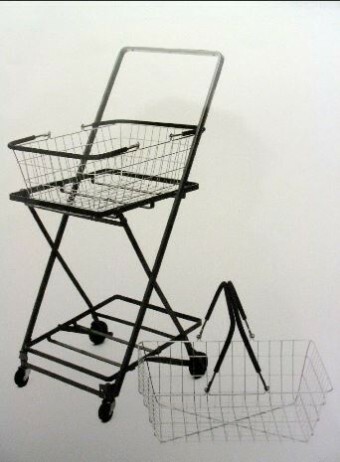 Well, every other cart manufacturer out there didn’t take kindly to Watson giving Goldman exclusive rights to make the nesting cart design, which rapidly became the cart pretty much every supermarket in the world wanted instead of the designs those companies had licenses to produce. So they sued… a lot over the course of the next few years, particularly attempting to get Watson’s patent invalidated. If this wasn’t enough, within two years of their agreement, Goldman’s firm decided that they didn’t want to pay Watson’s company the agreed upon royalties, and instead wanted to cut a new deal, even going so far as to cease paying him at all per cart, and just giving him a flat fee while they re-negotiated for a couple years. But with his inventive brain, Watson soon solved all his issues- he reworked the deal with Goldman to allow him to license the cart design to other companies, while giving Goldman a percentage of the royalties for every cart manufactured by those other companies. In exchange, the other companies would agree to drop their legal battles with Watson’s Telescope Carts Inc. I always thought Goldman developed the shopping cart for Piggly Wiggly. Wikipedia seems to think so as well (on their article on shopping carts). But Goldman isn’t mentioned on the wikipedia article for Piggly Wiggly and vice versa. Odd. I’m surprised that grocery carts are so recent a development. I remember going to the A&P store in Waterloo, IL during the late forties, but I don’t remember whether there were carts. There were none in the country store near where we lived, though. The storekeeper would bring items to the counter from shelves that were behind the counter and not accessible to the customer. That was still true in 1953 when we moved to the “city” (almost 8000 people!). no you couldn’t… and dont SCREAM at us…. you only think you could because your mind is embedded with the current final designs of the carts to compare to, so, you actually have no idea I’m afraid.